Miss Nepal 2015 is finally here! 19 contestants are selected this year to compete in the 20th edition of the pageant. The grand finale of the pageant will take place on 17th April, 2015, at Hotel Annapurna in Durbarmarg, Kathmandu. 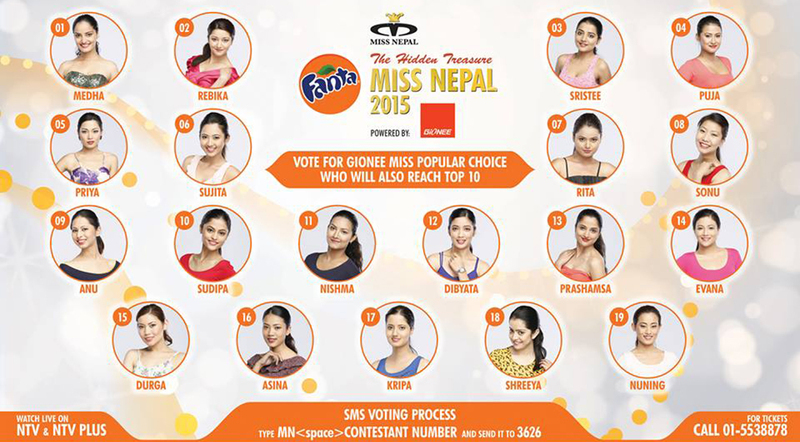 SMS voting open for ‘Gionee Miss Popular Choice 2015’. Vote for your favorite contestant and the winner with highest votes will get a DIRECT ENTRY in the TOP TEN SEMI FINALISTS OF FANTA THE HIDDEN TREASURE MISS NEPAL 2015. Voting ends on 17th April, 2015.